In my classes, I ask the shooters if they ever shoot their handgun using a one-handed grip. Across the board, around 35%-40% say they have done a little one-one handed shooting. When I drill deeper and ask, how many shoot one-handed with their non-dominant hand, that number is around 15%. These are not people who have never held a gun before. The majority of the people I ask classify their experience with shooting handguns as 3-5 years or more. What this tells me is that one-handed shooting, particularly off-handed, one-handed shooting is a skill that goes undeveloped for many shooters. There are plenty of gun owners who likely shoot recreationally, or for sport and maybe one-handed or off-handed shooting isn't something that is part of the routine. But if you own a gun and expect to use it in any sort of self-defense context, you should be developing this skill. Why? Why Would I Ever Shoot One-Handed? Think of the context of the overwhelming majority of defensive gun uses. These incidents usually occur during a physical struggle with the attacker out to around 10-15 feet. When in such proximity of the attacker, there are a few things that could force you to shoot one-handed. An injury to your dominant hand is very possible, especially if you are fighting the attacker. The obvious thought would be an injury inflicted by the attacker. But what about a self-inflicted injury to that dominant hand? El Cajon Police Officer, Slocumb applies pressure to a gun-gun shot wound during a shooting incident. If you have ever been in a knock-down, drag-out fight you might have ended up having one of your punches hit the bony skull of the attacker. Or maybe glance off their head and strike a wall or concrete. I have seen many people break their dominant hand during a fight. Not to say you wouldn't be able to fight through the pain or that the Adrenalin wouldn't allow you to get the gun into action, but depending on the severity of the injury, it could hinder your ability greatly. Your ability to shoot one-handed, using your non-dominant hand becomes important in a situation like this. What about if your hand is occupied? It's our dominant hand for a reason, and we naturally use it to hold our phone, keys, carry bags etc. Sure, when the time comes, you can drop items in your hands and go to your gun. A few years ago I wrote an article about the importance of trying to keep your dominant hand free. I received a few snarky comments that the whole concept is pointless because all you have to do is drop whatever is in your hands. These people obviously have never been in a shooting or participated in any reality-based training. If your range allows it, when practicing your draw, have grocery bags or a cell phone or something else in your hands. See if it doesn't affect your draw speed and fluidity. When the time comes to use your firearm, you likely won't be in a good shooting position with both hands raised, waiting for a beep from a timer. One-handed shooting, do you practice? How about if your hand is not occupied because it is holding something, but because you are defending against a strike. Maybe you're pushing or pulling your attacker with your offhand to create space or change an angle. What about if your hand is occupied with a handheld flashlight? There are different techniques used to deploy both a handheld flashlight and a handgun as documented here. But in order to use both, you are using a one-handed grip to a varying degree. I mentioned above about dropping the item that you have in your hand. What if the item is something you can't drop. 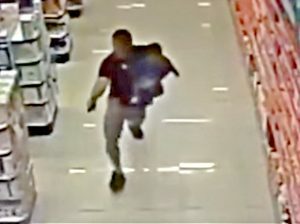 I know of a few incidents, where a good guy/gal had to use their firearm while holding a child. I am not advocating this in the vast, vast majority of incidents. I believe it is more advantageous to escape if at all possible, but at least in some cases, that wasn't an option and shooting one-handed while holding a child was the plan. Not a ‘first course of action' technique to shoot while holding a child, but it does happen. So one-handed shooting skills would be beneficial in this instance. 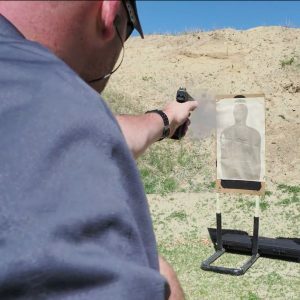 This obviously isn't a ‘how to' article on one-handed shooting. Much goes into developing your skillset. Drawing, gripping, malfunction-clearing etc., all are part of one-handed shooting. 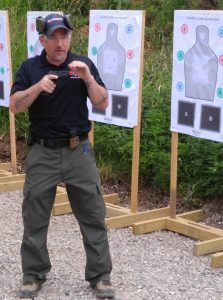 But I hope that if you hadn't before, you now see the importance of developing these basic self-defense handgun skills. 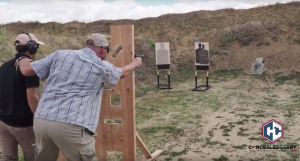 4 Responses to Why Practice One-Handed Shooting? Yes sir you are right , I do train with both hands.I always have , you can never till when one will not be usable.It may not be the best thing to do , But I also Draw and fire from the hip.IT’S always best to be able to pull and fire as fast and same as you can.Remember S–T. HAPPENS .If you ever been in that kinda spot you will understand. Our keys are on a ring and how many times do we while walking across a parking lot slip our finger through the key ring and fiddle with our keys and for get to be aware of just what is going on around us. We all do it at times but I try to remember to be alert. With all the shootings that have been going on some people still shrug it off and say it not going to happen in our little burg that stuff happens down in those other States but it happens up here to in a small rural town in Indiana. We are not safe any where. Seymour Indiana one Sunday morning a preacher was preaching and he saw a person wandering around out in front of the church and then he come inside the front and wondered around a little then went back out side and left.He wasn’t in church close, could have been on some type of drugs and was confused. Too many taking chances. good points I am not very good at doing this on a regular basis so thanks for the reminder. I bet I only practice a 1/4 of the time when I got to the range mostly because I usually take someone w/ me and spend a lot of time w/ them. I thing i do know if you are a right hander and shooting w/ your left hand and using your right hand for support make sure your right thumb is in the correct place when shooting w/your left hand or you will need a band aid. It is not natural so its easier to use just one hand instead of both. Very good stuff. I have practiced shooting one handed with either hand, but not nearly as much as I should have. Thank you for the reminder of why this is an important skill to develop.